An Asian-rustic save the date! At my first meeting with Lin, I realized that we both share a love for "arts and crafts". She wanted the save the dates for her wedding to have an "Asian-Rustic" feel that used light blues and browns. We ended up creating vintage seed packets (the "rustic") with labels that had her save the date information printed on the front. The back had wording about how & when to plant the "Chinese Forget Me Not" seeds. Her envelopes were lined with a handmade floral paper that Lin picked out. We hand-punched the back flap of her envelopes with the "double happiness" (the "Asian") character. Real, pressed Forget Me Not flowers were hand glued onto the labels of the packets. Lin really brought Double Happiness back to our roots when we used to do nothing but "handmade" designs. It was a labor of love, but so refreshing and therapeutic at the same time! 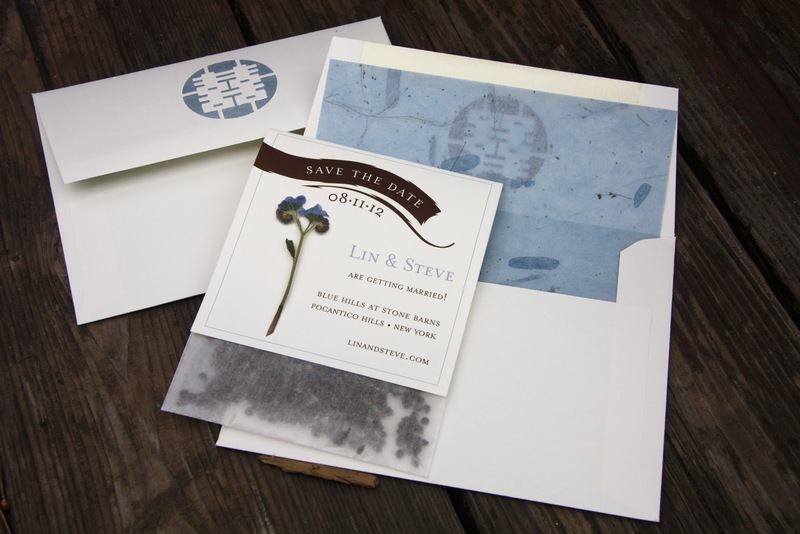 With Lin's creative input, your guess is as good as mine about how her wedding invitations are going to turn out! Check back in a few months!